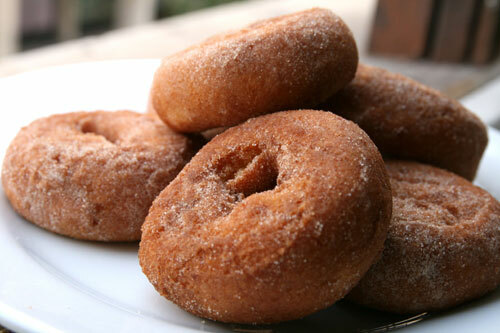 A while ago I did a guest post on "Or So She Say's" about my grandmothers yummy homemade doughnuts and the tradition of making doughnuts at our family reunions. Well, my grandmother's tradition has inspired me to create my own little tradition. I bookmarked this recipe a couple of years ago when I came across it in my Cuisine at Home magazine. I've always thought doughnuts and Halloween marry well, and what could add more to that perfect marriage than pumpkin and a little apple cider spice!? I think it's perfection! So I'll be making these little beauties on Thursday and sharing with some friends for a new Halloween tradition! 1. Whisk egg and yolk together in a large bowl until frothy. 2. Add pumpkin, sugar, buttermilk, brown sugar, and butter; whisk until combined. 3. Stir in baking powder, pie spice, salt and soda. 4. Fold flour in gradually until a sticky dough forms; cover with plastic wrap and freeze 15 minutes. 5. Meanwhile, heat 2" oil to 370 degrees in an electric skillet, deep fryer, or straight-sided pan over medium. 7. Transfer doughnuts and holes to a floured baking sheet using spatula that's been dusted in flour. 8. Fry doughnuts and holes in batches in the oil until browned, about 3 minutes, turning once (holes will cook faster). Drain on a paper towel-lined baking sheet. 9. Finish with sugar or glaze (see recipes below). 10. Makes about 18 doughnuts and holes. 1. Heat cider and salt in a small saucepan over low until hot. 2. Take off the heat and whisk in the powdered sugar until smooth. 3. Dip cooled doughnuts in glaze and let stand about 5 minutes. 1. Mix sugar and cinnamon in a small paper bag. 2. Toss doughnuts and holes in sugar mixture while hot. These sound so good for this cold weekend we're going to have. Thanks for sharing! These look delicious and I am obsessed with the Dunkin' version :) I just posted about a recipe I got from your site (sweet potato enchiladas)... you should check it out! !